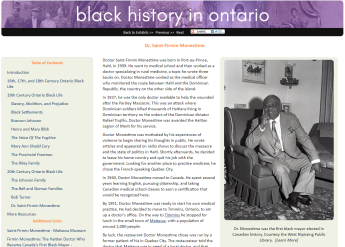 OurDigitalWorld new virtual exhibits on Ontario’s multicultural history. There are lots of digital divides. There is a literacy divide (understanding the production of the things you see), an access divide (having the infrastructure in the first place), and then there are representation divides – seeing people like you in the materials that circulate online. As archives and heritage organizations increasingly digitize and share their unique historical collections, it can sometimes feel like we’re widening that gap in representation, not closing it. I experienced this firsthand on a recent historical research project focusing on Ontario’s multicultural history. OurDigitalWorld is a nonprofit that works with hundreds of Ontario libraries, archives, historical societies, and interest groups to make digitized historical materials online and accessible. With funding from the Government of Ontario through the Ministry of Citizenship and Immigration, we are undertaking a series of projects bringing together materials from across Ontario to explore the histories of women and multicultural communities. 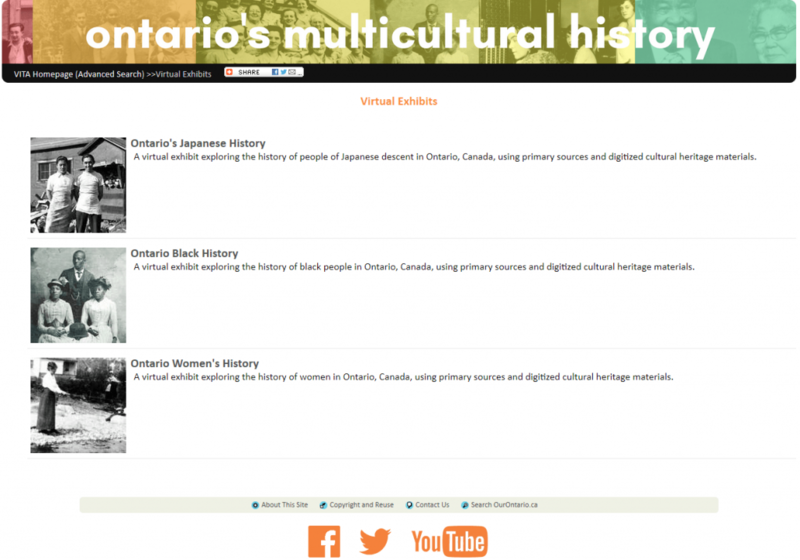 We’ve assembled three virtual exhibits: one on Ontario’s women’s history, one on black history, and one on Japanese history. These exhibits include artifacts, photos, news clippings, manuscripts, maps, and drawings from over 50 cultural heritage organizations in Ontario. The first stage of the project was to build the virtual exhibits and to show what can be done when we bring hundreds of heritage collections together. The next stage will allow for an expansion of these virtual exhibits and develop curriculum resources which will allow Ontario public school educators to bring these primary sources into the classroom. We plan to produce a range of educational resources including: exercises and activities, homework assignments, assessment rubrics, presentation slides and handouts, and multimedia modules that students can explore, appropriate for a variety of grade levels. All of this material will be made openly available under Creative Commons licenses, so that people can reuse and adapt them however they want. I’m a regular reader of Active History and always find myself inspired by its content. In fact, after reading about Ontario’s history curriculum, I reached out to Dr. Samantha Cutrara to talk about this stage of our project. We’ll be working together this summer, schedules permitting, on ways to bring primary sources to Ontario students. I also spoke to teachers, archivists, and librarians who have experience using primary materials in the classroom—to talk about archival literacy and how best to share and teach with materials that deal with trauma, such as oppression of and discrimination against underrepresented groups. 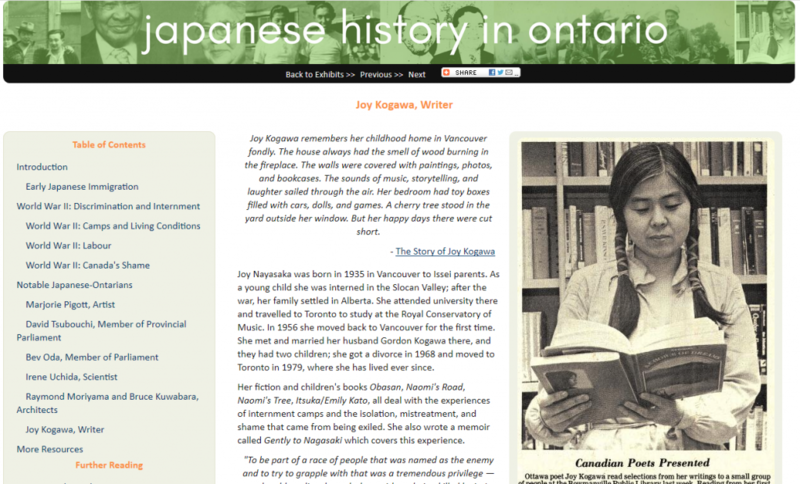 While building resources relating to Ontario’s multicultural past I’ve found, so far, that marginalized communities have worked tirelessly to document themselves and share their histories: the Ontario Black History Society, the Federated Women’s Institutes of Ontario, the Japanese Canadian Cultural Centre, and SEDAI were great resources for timelines, exhibits, facts, and materials. Published books helped quite a bit—from children’s books about Richard Pierpoint and Henry Bibb to the fantastic book about early black settlements by the late Linda Brown-Kubisch. Rarely, though, have the established heritage organizations in Ontario or elsewhere in Canada made overtures to help preserve and steward these materials. A fantastic exception is Brock University’s collection of documents and photographs capturing 19th century POC, donated by Rick Bell, a firefighter in the St Catharines area who found this family memorabilia in his inherited home. Many of the materials are so old Rick and his family aren’t able to identify the people in portraits, but it’s still sadly uncommon to see so many beautiful photos of Black Canadians or Americans from the 19th century. As we move into the 20th century we see more candids, celebratory moments, and commemorative photos before heading off to war. In contrast, at our National Gallery of Canada, part of their permanent exhibit is a selection of studio portraits from the 19th century where you can learn about how much white settlers liked to photograph their pets. Frankly, while white people are documented both as accomplished individuals with serious achievements, and as part of everyday life in candids, portraits, and group photos, people of colour get documented only when they overcome the significant hurdles of racism and prejudice to become “first black ____” or “first Japanese ____.” Rarely are they present in the archive as regular everyday citizens with full and fulfilling lives. While communities have collected their own documentation, established heritage organizations such as our public libraries and municipal archives aren’t making collecting and digitizing these materials a priority. That needs to change. I also found, during the process of building these exhibits, the utility of working iteratively with Wikipedia: looking up dates and factoids, at first, but then adding new information as I went along. For instance, I was able to add links to several historical newspapers where Agnes Macphail’s political journalism was published; during her tenure as an MP in Ottawa, she often sent columns and reports to rural publications. While I was there I noted some glaring omissions: her profession in the introductory info-box was listed solely as “schoolteacher,” not “journalist” or “politician”—an embarrassing inaccuracy for someone so notable. You can see my before-and-after changes at this link. In total, I improved 12 relevant Wikipedia articles before I curbed the impulse for the sake of time. OurDigitalWorld is motivated by Ontario’s Culture Strategy, which emphasizes, among other things, diversifying our curriculum and diversifying our online culture. That includes heritage and history, and means that we need to shift our focus away from documenting the most famous people of our past (who, through systemic advantages, are rarely non-white and non-male), and start filling in the gaps. “Documenting the now” should mean not just taking up community history projects (especially as a way to mitigate our dwindling community journalism) but prioritizing materials from those least represented in the past. There has been a 20th-century shift, in official document repositories like the Archives of Ontario or Library and Archives Canada, away from simply being the depository of government and business records. Archives now focus on the everyday, the family, the grassroots, and the bottom-up. This sounds great, in theory, and sounded great to many an archivist of the past 40 years—but it does tend to perpetuate existing scales of injustice. White families with money and prestige and a sense of their own history often have rooms full of photo albums, scrapbooks, and family documentation; the retired members of the family had time and energy to exert on obsessive genealogical documentation and finding links back to Charlemagne. A refugee family who arrived in Canada in the 1980s with nothing may have quite a collection of documentation from that time onwards—and may have been able to persevere into economic stability and even prosperity—but by virtue of their citizenship, their family history will be cut off at the point of entry into the country. Anything further back has to be solicited by way of oral history and memoir—which takes time and money, and isn’t in a traditional archivist’s skillset. We see this notably in the history of Japanese-Ontarians, where almost every person in our documentation has some tie to World War II internment, which included being robbed of their homes, businesses, and possessions, including family heirlooms and memory objects. So what’s next, after this part of the project? Ideally, active solicitation from underrepresented groups to keep diversifying the digital historical record. Our VITA platform has a contribution module that allows anyone to upload digital documents (photos, stories, documents, audio, video) and describe them for us. We want to coordinate a province-wide contribution campaign that helps citizens across Ontario pinpoint the best place to digitally donate their materials—and, ideally, encourage analogue donations to physical archives and special collections as well. First, though, we want to get diverse materials into the classroom. If you’re an Ontario educator, we want to talk to you! Please consider this post an invitation to contribute your knowledge and expertise, and offer us feedback or suggestions. We’d love to hear from you. Allana Mayer is the Media Coordinator for OurDigitalWorld, an Ontario-based nonprofit. She is an archivist, researcher, and writer in Hamilton, and writes about art and culture, technology, copyright, and history. The access divide seems to me to be the biggest challenge. Consider the extensive collection of the Multicultural History Society of Ontario, very little of which is digitized, and likely will not be for quite some time due to (what else?) extremely limited resources. They have a goldmine of oral history recordings… most of which are on cassette tape, in bankers’ boxes.